The Professor and I have been hanging out down in Anna Maria the last several days. 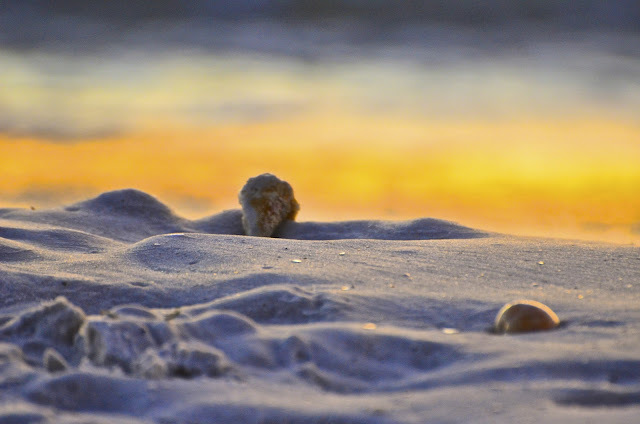 Nothing but sunshine, shells and sand. And (a lot) some wine. We are totally avoiding all shopping malls and city traffic. Not our kind of crowd. We much prefer keeping company with these oystercatchers each evening. Although ... I'm not sure they are keen on our company. Do you think one of them is giving us the 'bird'?? Malls and crowds in general are definitely not my thing! Lovely photos! Yesterday I unfortunately had to brave the crowds for presents for the (grown up) grandchildren - today I am, in consequence, to tally exhausted. The further I get from 'civilisation' the better I feel . 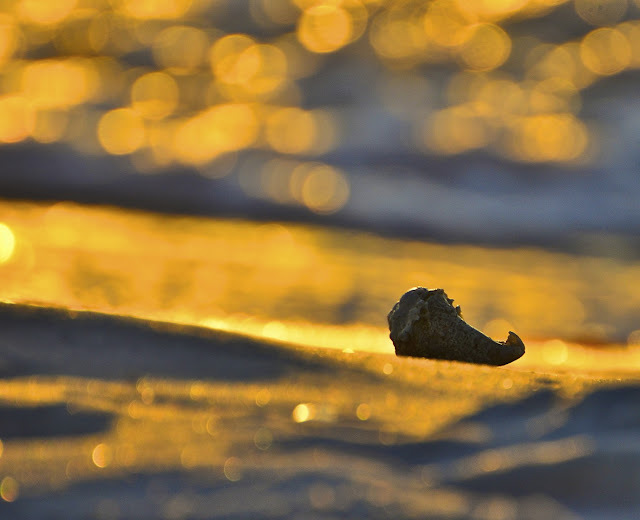 . .
Solitary rambles along a deserted beach would be a dream. Enjoy your freedom with your Professor and have a wonderful Christmas together. Im not going out alone. ha ! its snowing. I would need hockey gear to get into a mall and avoid getting trampled. Fantastic way to spend the days before the holidays! I hate to shop!! Your photos are superb! Enjoy, Reena! I love the beautiful light in these photos. What lovely way to spend the holiday (or pre holiday). I've been catching up on my blogs.... what wonderful news about your vacation home in Maine! Your views were out of this world!! scenes like this always remind me of the nicholas cage / meg ryan film where the 'angels' meet on the shore to watch the sun rise or set each day. LOL... I would definitely say one of them is giving you the bird. Theres a joker in every crowd. You probably meant to showcase the birds but I like what you did with the shell on the sand pictures. Nice. HI Renna...soak up some sun for me would ya!! Lovely photos of the shells and great..great...shot of the Oystercatchers ..The bird?...for sure!! Great photos of the sunshine, shells, and sand - and of course the Oystercatchers! Your photos take my breath away. They are so wonderful. I also keep Christmas simple. I think it is a great way to spend the holidays. 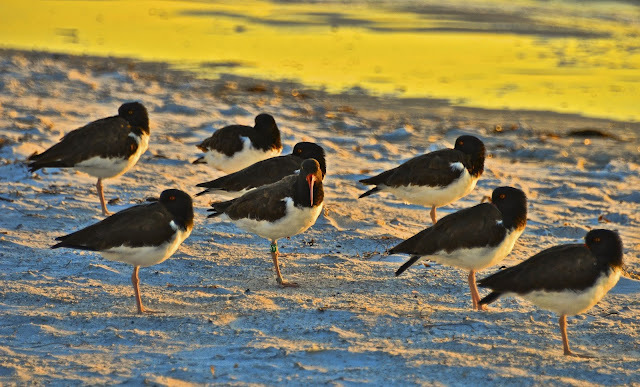 Wonderful photos of the oystercatchers. Happy Holidays! i love the second one, looks surreal! i too keep xmas simple. Reena, thank you for all your words, that you left in my Ocean, this year. I Wish you a Merry Christmas and a Great 2012! Isn't it a lovely feeling to be out in the wilds while the shoppers are in their natural habitat also! Love your pictures! Just beautiful. You chose a perfect place to be! Gdreat shots.I love the birds. My goal each year is to stay away from the mall and the traffic and I've accomplished that. I love online shopping for gifts, and local places. We're not too keen on malls and crowds either. Beautiful photos. Love the second shot. It's like some kind of desert landscape from a sci-fi movie! You are a true artist to capture precious moments. You funny lady. What a sense of humor you display. "Giving you the bird?" Don't they know how well you take care of their kind? Shame on them if they are. Have a wonderful time. Cheers!! Beautiful photos. Merry Christmas to you. I would love to be there with you.. sigh..so peaceful....Happy Holidays!! 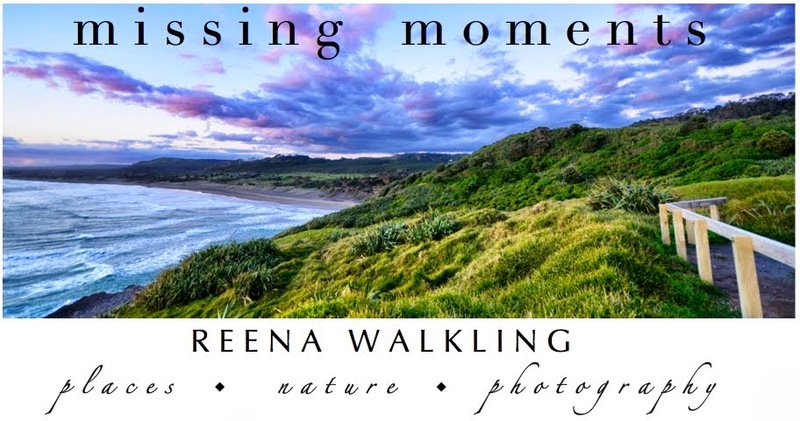 Wonderful images Reena.. you have some wonderful wildlife to share. I feel the same way you do about malls and crowds. The light in these photos is beautiful! Have a wonderful holiday! Congrats on POTW :) Well Done. I (hick) think so. hehe Glad you are spending the holidays in your own fun way. oh what divine light! stopping in to wish you and yours the merriest of holidays! take care Reena. So funny! I'm with you - the beach and some wine wins over malls and crowds any day! Congrats on the POTW! Beautiful shots! The light is just gorgeous. I'm glad you are surrounded by such peace and beauty. The first picture looks like it is raining gold flakes! You've got your Mojo working Reena. I don't need a glass of wine to tell me your having a great time! Look at that beautiful sunlight! I am jealous! i'd rather hang out on the beach then do pretty much anything else, myself !! ahhhh, I certainly wish I was at the beach to hang out with the birds, the fish and anything else offers itself to the soul...lovely. I had to look up your location. It looks so relaxing and great for beautiful photos. Happy Holidays to you. Gorgeous light and color!! It's out of this world, Reena!